There’s a lot of talk these days about folks wanting to cut down on their bills and configuring their homes to be able to watch TV without a cable subscription, or “cutting the cord” as it’s called, for a number of reasons. All which seem to be related to a feeling that maximum value is not being derived from a traditional cable or satellite TV subscription. The rise of new content delivery mechanisms utilizing the Internet also is contributing new options that supplement and, for some, rival traditional cable and satellite TV. For all you prospective cord-cutters, this guide will try to help you understand what options are available to watch TV without cable, satellite plan or other residential service. This guide is primarily focused on the US market as there are differences in the availability of content on a per-country basis. Take stock of the TV programming you currently watch and determine what you can and cannot live without. It may be helpful to compile this information in a spreadsheet. For example, if you watch an entire season of Mad Men, take note of that and the fact that a typical season is thirteen episodes per year. If there are certain things you just can’t live without like ESPN or CNN, you are not a good candidate for cutting the cord because the programming is simply not available sans a cable subscription. 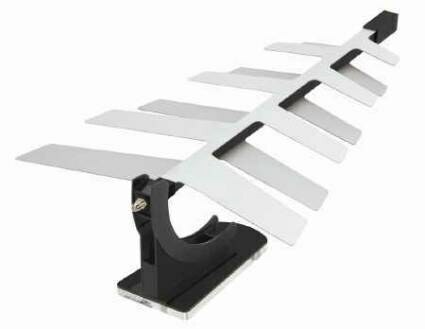 In many cases, you have access to high-quality broadcast programming with just the use of an antenna. This programming, often referred to as over-the-air (OTA) programming, is completely free. Depending on the content the programs are in many cases high-definition (HD) and contain Dolby Digital surround sound audio. Typically, network affiliates of ABC, CBS, CW, FOX and NBC will broadcast in each metropolitan region. The first step to gaining access to OTA broadcasts is to locate the direction of the broadcast antennas. AntennaWeb is an excellent resource that will provide this information along with a recommendation for the type of antenna required to receive each station’s OTA broadcast. **Note, some areas and providers where you have Cable Internet service will allow what’s called ClearQAM broadcast via a compatible QAM tuner. These are unencrypted high definition channels which you can get via your cable service. We did not fully include this in the guide since there are enough cable providers who do block this service, and the channels are exclusively for your local channels as well. Cons: For TV content, you must wait at least until the season ends, could be relatively expensive depending on how much content is purchased or viewed. The most obvious way to watch TV without cable is simply by waiting and buying the shows you want to see when they are released on disc. 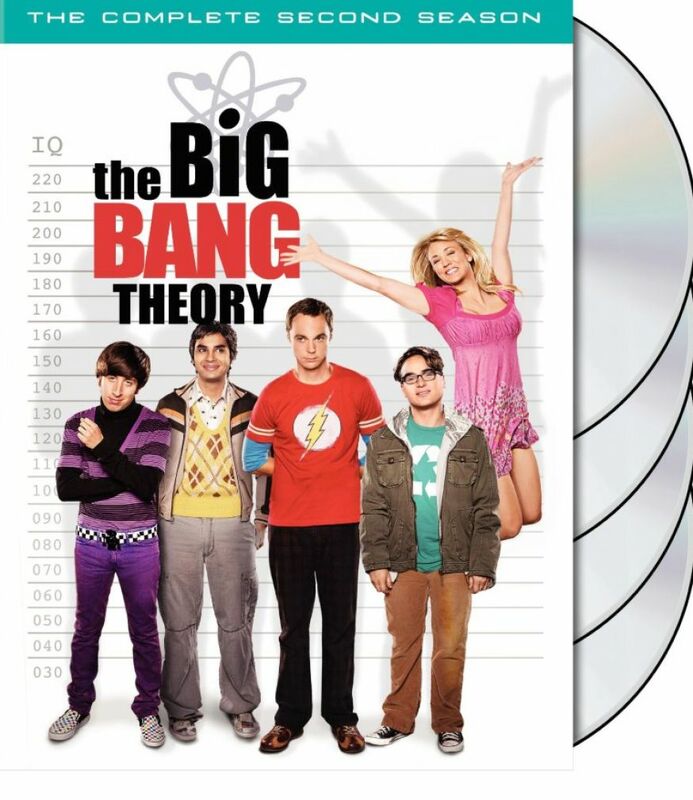 A lot of programming you watch may be available on Blu-ray or DVD, virtually all popular TV shows almost certainly. The benefits of choosing a disc-based method of content delivery are that you can see the programming in its highest available quality and it may even come with extras that were not broadcast. The main disadvantage to this is that your show may not release their season on disc, and also that the price of discs can really add up. Since you cannot buy a single episode on disc you must purchase entire seasons which range anywhere from $20-70 per season. If you have not yet committed to an HTPC and only have a DVD or Blu-ray player then this is the section for you–especially as you might have noticed your local Blockbuster Video has gone out of business. Luckily those huge stores with the bright blue shirted and depressed employees has since been replaced by a wealth of tiny kiosks right by your friendly local supermarket or 7-11. These small boxes hold a ton of movies, both Blu-ray or DVD, that you can rent for as low as $1. Blu-ray discs cost a bit more, and rentals are only for 24-hours. You can even reserve a movie of your choosing online via their website. It’s a pretty convenient service if you prefer the traditional discs or care for the quality of Blu-rays. And while the range of movies is great – you can get anything from new Michael Bay movies to old classics like Gone With The Wind – the selection isn’t always strong. If you’re looking for a specific movie, rental kiosks will always be a gamble. 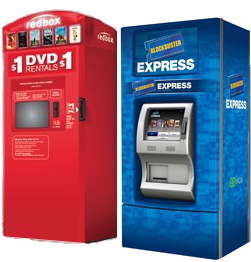 There are two major players in the kiosk space–Redbox being the dominant force, and Blockbuster Express starting to gain some traction as well. I’m not familiar enough with each source to properly evaluate each, but as with any retail experience your selections may vary, and every time I’ve gone to the market I’ve seen a line by the kiosk waiting to purchase or return their discs. A slight inconvenience of course, but one nonetheless. We won’t spend too much on this topic since it’s very similar to the above category, but with a twist. 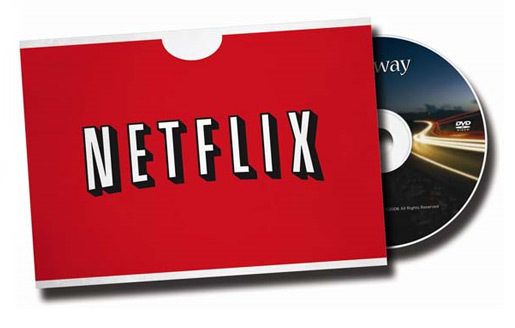 In addition to being able to receive the physical discs in the mail (both Blu-ray and DVD) from Netflix and Blockbuster, the former also provides with your monthly fee the ability to stream an unlimited number of shows and movies available in their library. The beauty of this system is the lack of any extra cost–for shows you just wish to watch immediately that are available you can stream, and for those requiring higher definition and surround sound the disc can be sent to your house. Also unlike the kiosks above there is no limit as to how long you can keep your discs, and no rushing to the kiosk to return on time–simply drop it in your mailbox. It’s not all roses however as there is a 30-day rental window imposed by movie studios (Warner, Fox, Universal) against Netflix meaning on all new releases you have to wait 30 days before they have access to them, and then you have to wait for it in your queue. Also, since Netflix’s streaming works off of licenses with the content providers that can expire, there is no guarantee that a show you start to watch will still be there several weeks or even days later to continue or finish. With Blockbuster being bought out by Dish it still remains to be seen exactly how their business and offering will evolve and whether they evolve their business model into offering a streaming service, but for now the service is still continuing as a mail-in service. Cons: Shows can often disappear from streaming libraries/Multiple sources with different content means you may need multiple sites to view the content you want. Picture/audio quality lacking compared to disc counterparts. The prominence of Netflix and Hulu in the last few years has truly helped the options available to cord cutters in that there are an awful lot of options available to users looking for legitimate sources to obtain their favorite shows instantly. Where Netflix dominates on streaming movie selections, it’s much less dominant on TV shows since it depends on what their current agreement with providers is–did we mention that they can remove the availability of streaming shows and movies at any point? Yeah, that’s a bummer to be certain, especially if you were midway through a season of your new favorite show. Hulu.com and Hulu+ is a service run by the actual television content providers and is equally frustrating. Where Hulu.com is free–you just have to watch ads–Hulu+ charges a monthly fee similar to Netflix for premium streaming. 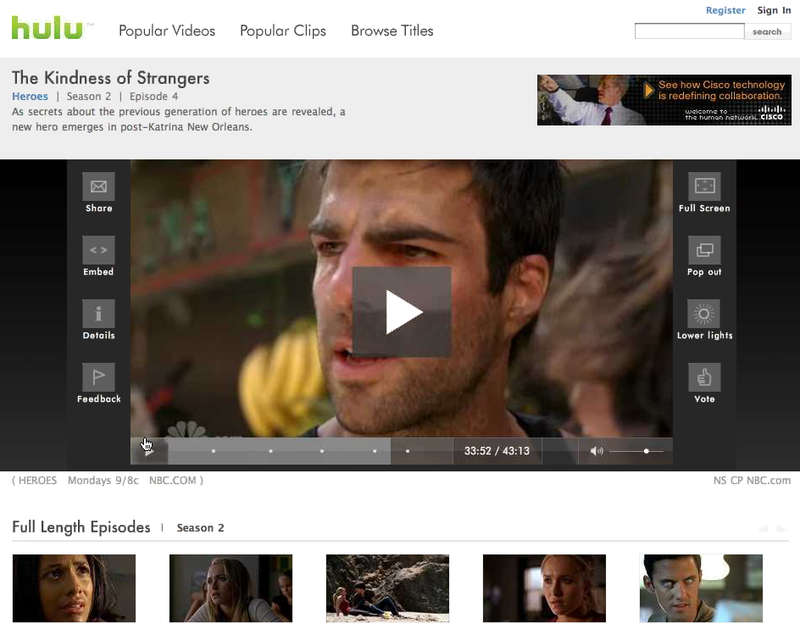 The conflict comes in that the two libraries are inconsistent; what might be on Hulu may not be on Hulu+. This comes into play depending on how you view your content how you might not be able to watch a particular show. 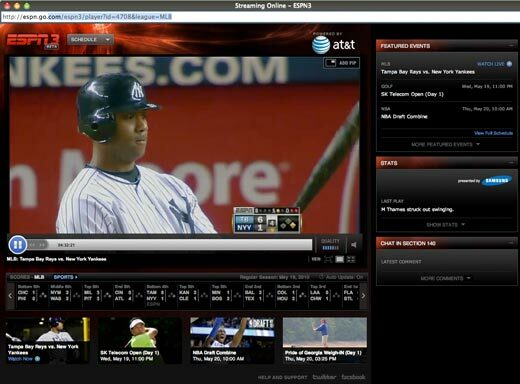 Then there’s my favorite service, pretty much ever–ESPN3 (formerly ESPN360). This phenomenal service is tricky if you are not with a supported Internet provider (such as Comcast, and lots more) since there is no payment model for you to add it otherwise. While the site does not allow you to watch editorial programming such as SportsCenter or Pardon the Interruption, what it does allow is the actual sporting events–and lots of them! There are awkward moments of silence during commercials and sometimes halftime programming is blocked, but the important thing is that you get to see live sporting events in surprisingly good quality. While it’s frustrating you can’t have more control over the quality of the feed, I will not take this site for granted. A new site from ESPN which has a lot less support from Internet providers is called ESPNNetworks.com which not only offers sporting events, but also all of the shows from ALL the ESPN channels. If they wanted to charge $10/month for this awesome site, I would pay in a heartbeat! Amazon recently announced their own streaming service as well, with an affordable cost of only $79 per YEAR–which also includes Amazon Prime membership for free shipping on all purchases. Our own team tested the site when it first began streaming and they were overall quite pleased with the selection and performance the site offered. EDIT 5/31 George: You do NOT get full access to Amazon’s 90,000+ streaming library, like you would on a TV or other device which is supported by the streaming service. You only get access to ~5,000 titles and–when I checked a few months ago–the selection truly sucked and there were very few titles in HD. And then there’s all the thousands of other streaming websites and offerings. From companies like Revision3 which produce near professional quality programming, to basic and shorter programs such as “Ask a Ninja,” there are a ton of free shows available for your viewing pleasure. The biggest dilemma is usually just finding the show. If you know all the programs you want, then you can easily setup your podcast reader to download all of them and place them in your video library all neat and orderly. If that seems like too much work, or if you just like a more flexible method of finding and downloading programs then you will want to go with a number of different plugins and programs out there for your pleasure. From a plugin type application like SecondRun.tv 2.5 to the complete HTPC software offerings of a Boxee, these software exist to consolidate all the various online programs at the touch of your remote. And if you have not committed to a home theater PC yet (shame on you!) 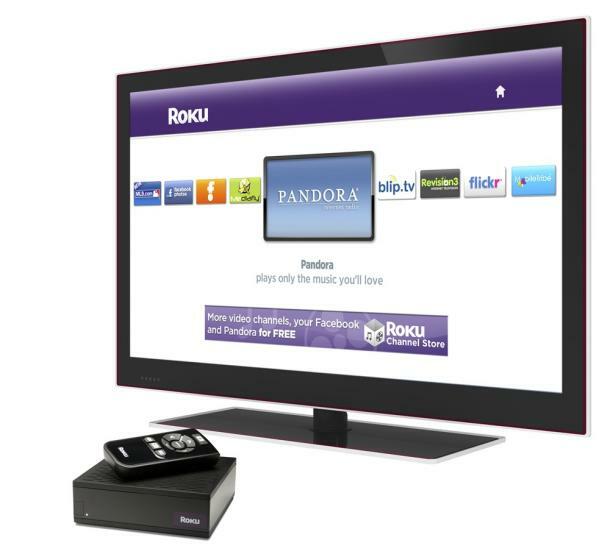 or maybe just need some streaming capabilities in the kitchen or bedroom, then boxes such as the Roku or Popbox (and even the Xbox 360) exist to bring these sources to a small and affordable little box. These connected devices are optimized specifically for these streaming programming, and while they are significantly more limited than a full blown HTPC, they more than serve their purpose. Pros: Um…it’s free and readily available. Convenient and easy to find downloads of high definition and commercial free programs. Con: Quality on streaming sites is awful and unreliable. Legally questionable. What is this topic? Well, we won’t get into specifics about actual sites that exist, but rest assured there are a lot of websites out there that host links to some feeds on Justin.tv, Ustream, Veetle and a number of other worldwide video streaming sites where you can tune in for live video streams. 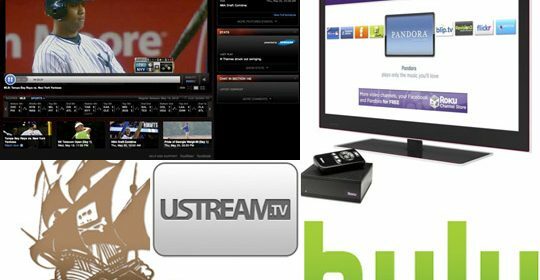 It is difficult to really count these sources as true sources of cord cutters ammunition given the often poor quality and extreme unreliability, but the fact that they exist should remain as a valid solution for those few and far between events you can’t miss but have nowhere to view. 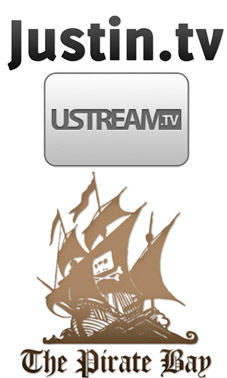 And then…there’s the taboo “BitTorrent” (or Usenet for you super techy folks) which is more well known for download movies and video games, but is equally powerful and plentiful as a source for high definition television episodes. You find a tracker, like the good old Pirate Bay which has received a lot of attention over lawsuits they have lost, but there are plenty of other sites that exist which have every popular TV show in high definition available for free, or the cost of your bandwidth and morality. To top off the temptation factor these videos in addition to being in HD also include no commercials. Please be aware, Missing Remote does not condone nor support any of what’s been said in this section, but the fact remains that they exist and there are many people out there who rely on these methods in their quest for cord cutting nirvana. So which solution is the best for you, ultimately only you can decide if these options available to you are sufficient enough to cancel your subscription and watch TV full time without cable. The answer now is no longer IF it’s possible to do so, but more so if you are willing to take the necessary steps to do so. Of course, having a home theater PC in your living room makes the decision that much easier since you have direct access to almost all the content we have mentioned without having to purchase any additional devices. QAM gets blocked in areas? I thought that cable providers were legally required to carry unencrypted QAM on any local channel that was transmitted via ATSC. I do QAM down here in San Diego, only get a handful of channels, but I do get the major ones(NBC, CBS, ABC, FOX, CW, PBS). I’ve lived in several apartments in the bay area (Comcast), and unless I have an active basic cable subscription I don’t get zilch via QAM. From my experience in spreading HTPC goodness to family around the states and a few providers I’m pretty sure you have to have some sort of cable service to “technically” get the local in-the-clear QAM channels (I used to get the basic cable package, 30 channels or so from TWC and really just used the QAM channels). I believe the FCC digital transition rules simply imply that cable operators are not allowed to encrypt any locally broadcast HD stations. I’ve switched to OTA and won’t go back. However, when I dropped all cable TV and just stuck with high-speed internet the channel trap they install only blocks basic cable service. Since the internet and QAM frequencies are too close to separate with a trap I still can pick up all the QAM channels. The biggest PIA is they often change the frequency of the channels and I often had to manually add a lot of channels in 7MC. Its not bad, but if you can get OTA, its less work. Yes, I have heard there are a few markets where they don’t offer clear QAM. 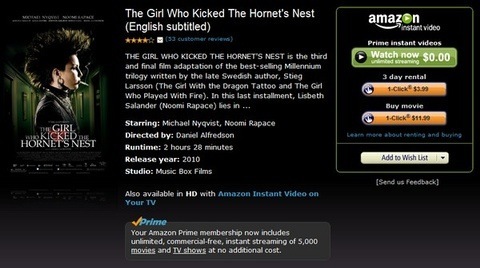 A clarification on Amazon Prime. You do NOT get full access to Amazon’s 90,000+ streaming library, like you would on a TV or other device which is supported by the streaming service. You only get access to ~5,000 titles and–when I checked a few months ago–the selection truly sucked and there were very few titles in HD. I ran one UHF and one VHF antenna combined in my attic for my OTA. I looked on TV Fool to find which direction to point them and have not had any issues. Don’t let radio shack fool you into a HD antenna, there is no such thing, it’s just marketing. A block from me is a Redbox at Walgreens and across the street from that is a Blockbuster Express at QuikTrip. Both are outdoors. I’ve used the Redbox a lot, the blockbuster is newer and I’ve only used it once. The Blockbuster seems more weatherproof. The disc slot is behind a clear plastic door, instead of an open slot. Blockbusters touchscreen is about an inch above the video screen, making it hard to hit the right button. Redbox screen is unreadable in direct sunlight, not sure about Blockbusters. The redbox is unreliable, it was not working or not accepting returns around20% of the time, but I think that is because it is outside. The nearby McDonalds has an indoor redbox that is reliable. Redbox DVD’s come in a folding CD-size case. Blockbusters come in a cartridge that is the same height and width as a DVD case, but much thinner. The DVD slides into a slot from the bottom. There isn’t enough difference between the kiosks to favor one or the other.They are just too similar. The biggest difference between the two services is the 28 day delay. Redbox has to wait for some movies, Blockbuster doesn’t. Another difference is the rental version. I’ve only used the blockbuster kiosk once, and that DVD (Despicable Me) was a rental version that had the main movie but all special features were disabled. I don’t think I’ve gotten that at a Redbox.